AMY AND LOUISA SAY "CUT IT SHORT!!" AND YOU ALSO GET DVD 222 FOR FREE!! 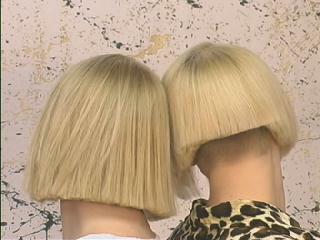 Amy and Louisa's haircuts are now available on DVD 222. 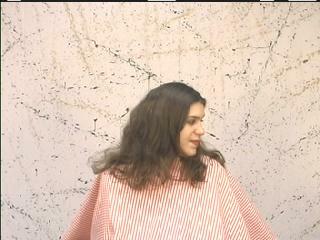 Amy has worn her hair long for over 10 years, and Louisa has never had short hair. They both wanted a dramatic change, and that's exactly what they got. CLICK HERE TO ORDER YOUR COPY OF DVD 221 AND YOU'LL ALSO GET DVD 222 FOR FREE!! Louisa takes a long look as the clippers are plugged in. She made a lot of great faces as her hair was clipped short- very cool cut!! Sylvia and her sister Julie came to the studio for haircuts. Sylvia has never had short hair, and was understandably nervous about getting it cut. Everyone thinks of Sylvia as "the girl with the long blonde hair." It's part of her identity. But now she wants a "change of identity" which will be easy to maintain and look more modern. Out come the scissors, and off goes Sylvia's hair!! Julia is getting her second haircut at our studio. She really likes the buzzed back, and this time wants the back cut much shorter than last time. Both Sylvia and Julia love their new haircuts!! 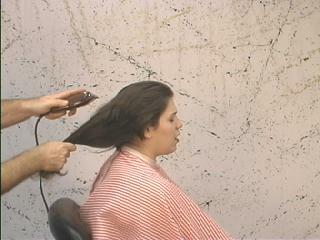 When Nanette arrived for her haircut, she said she wanted it cut to no more than an inch long. What did Nanette think about her new haircut? "I love it!" she said.